This is like reading an electrocardiogram, strong in the start,low in the middle and a small punsh near the end. 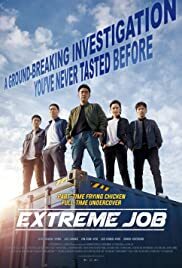 this seoulywood action comedy really works, even though the subtitles are incoherent and strange, and i dont know anything about the korean language, i could not avoid the comedy. the start sequence are of the kind that hollywood has forgotten when making comedies, and the chicken twist where really brilliant. want to laugh take a look. the story and plot are so original and twisted ,and should have recognision .the filmography,and managment of locations and settings are great, sound effects and acting are even better, but for me its like being in the place where they speak in toungs, and they speak very fast, so hang on anyway,its hilarious to the end. the grumpy old man loves chicken, and got addicted to this one.i give 10, -2 for the subs, total of 8, very recommendable.